GST (Goods and Services Tax) was implemented in India on 1 July, 2017 to replace multiple cascading taxes levied by the central and state governments. Well.. this tax has changed the whole tax structure of the country. But it didn’t reduce the burden of the tax on the customers rather things got complicated. In order to make eating out lighter on customers’ pockets, the GST (Goods and Services Tax) council slashed the tax rate for restaurants last week. As per the new tax rate launched last week, it was expected that the tax rate for restaurants would down to a uniform 5% from the earlier 12% for non-air conditioned restaurants and 18% for air-conditioned restaurants. However, even after the application of new tax rates, there are no changes in the rates to customers. Although customers were expecting considerably lower prices but didn’t find any drastic drop in the food bill at restaurants. Many of the angry customers lashed out at restaurants. Mc Donalds, the chain of burgers also disappointed the customers. There are no changes in the rates of food after application of new tax rate. In fact, McDonald’s has increased the MRPs after implementation of new rates and thereby make the total bill nearly the same. The customers took it to Twitter along with pictures of food bills before and after last week’s GST cut. Twitter has barraged with the tweets of angry customers. On this rage, McDonald’s India said that as government removed Input Tax Credit so their costs have gone up. 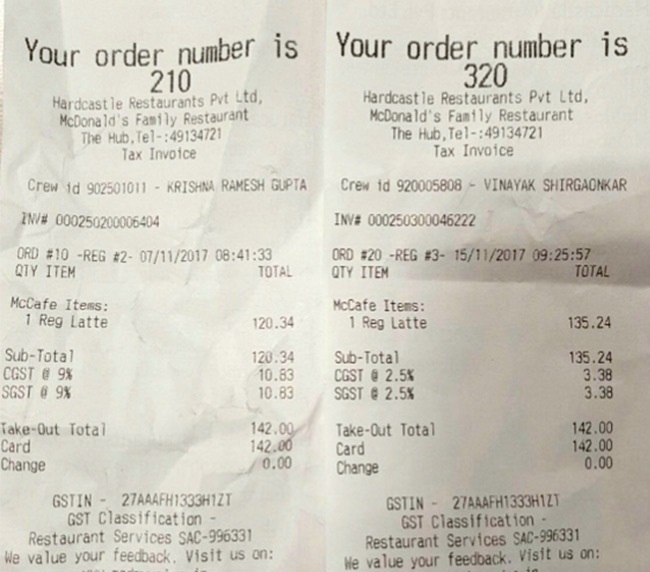 So, Mc Donalds has not been benefitted with GST rate cut. Earlier, restaurants used to get input tax that helped them to reduce cost. Next articleAadhaar Card-Mobile SIM Linking – Now a click away; no need to visit store. Read More!